This case study involves two related proceedings in the Federal Court of Australia and the International Tribunal for the Law of the Sea (ITLOS). 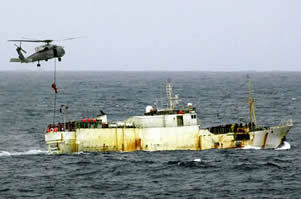 Both cases concerned the arrest of the Russian-flagged longline fishing vessel, Volga, which was apprehended by the Australian Navy for illegally fishing for Patagonian Toothfish in the Australian Fishing Zone (AFZ) adjacent to Heard and McDonald Islands, remote and uninhabited islands 4,000 km southwest of Perth. 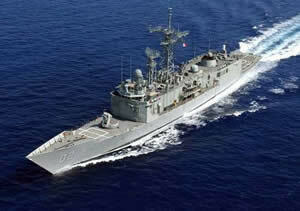 The Volga was the second of two Russian-flagged vessels arrested by the Australian frigate HMAS Canberra within 24 hours of each other on 7 and 8 February 2002. 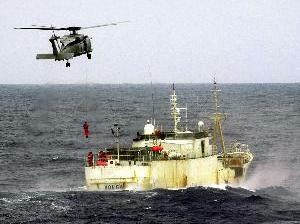 The vessel was arrested by Australian naval personnel who rapelled from a helicopter launched from HMAS Canberra (see photographs on right). The arrest occured 0.5 nautical miles (900m) outside of the AFZ and exclusive economic zone (EEZ) just after the vessel existed the AFZ and EEZ. Mr Ferris conducted a search of the vessel. 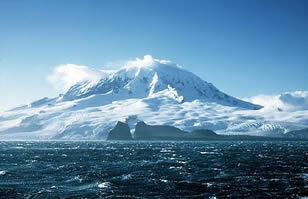 There were 120 tonnes of Patagonian Toothfish on board the Volga at the time. As he carried out the search he noted a large conveyor belt running from the fish factory working space located forward of the bridge to the stern of the vessel. It was wet and littered with damp small fish scales. In the stern area he found fresh wet fish gut and more damp fish scales. There was a number of fishhooks lying on the deck around the area of the conveyor belt. He found a small fish that looked like a Scaly Mackerel lying on the deck which was soft and pliable to touch. This part of the vessel was the long line setting space. There was a number of wooden segmented areas fenced off containing a large number of concrete blocks with a snap line attached to each block. On top of one of those piles of concrete blocks was a very large fishing net containing a large quantity of foam sponges. When Mr Ferris squeezed some of the sponges they oozed with water. There were also several racks of shelving containing brown plastic trays used for preparing small sections of long lines and holding baited hooks ready for setting. There was no prepared baited long line in the containers but they were wet and all the ones he checked at the time contained a large quantity of small fish scales. Mr Ferris then inspected the fish factory area which he described as damp and untidy. There were brown plastic trays scattered all over the working benches. There were numerous plastic bags containing a large quantity of fish hooks attached to a length of monofilament fishing line lying on top of the working benches. Mr Ferris searched for evidence of fresh product and eventually found two Patagonian Toothfish under a wire cage. One still had a hook in its mouth attached to a piece of fishing line. Both were still soft and pliable. He opened the gills on one fish and blood oozed out. The gills were still red in colour. When he did it with the other fish the blood did not ooze out but the gills were still pink. After its arrest the Volga was directed to sail to Freemantle in Western Australia. There is was seized under the Fisheries Management Act 1991 (Cth), under which the vessel, its nets and catch were forfeited to the Commonwealth. 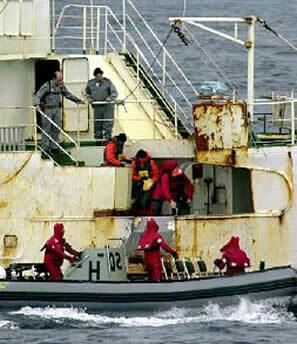 The Russian company that owned the vessel, Olbers Co Ltd, applied to the Federal Court of Australia for an order that the arrest was illegal and that the vessel was not forfeited to the Commonwealth. The company also claimed damages and other relief. The Federal Court dismissed the application. An appeal against that decision was dismissed by the Full Federal Court and special leave to appeal to the High Court was refused. 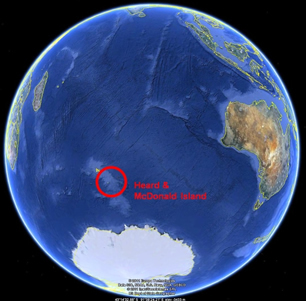 Extract of naval helicopter flight plan tendered in evidence showing location of vessel relative to boundary of AFZ and Australian EEZ, 200 nautical miles from Heard & McDonald Islands. Plotted maps tendered in evidence showing location of vessel relative to boundary of AFZ and Australian EEZ. Photographs of arrest of the Volga (originals in colour). GoogleEarth image and maps showing location of arrest of the Volga and picture of Heard Island. Interlocutory decision dismissing application for security for costs being ordered against the vessel owner: Olbers Co Ltd v Commonwealth of Australia  FCA 1269. Interlocutory decision dismissing application to stay the proceedings pending related criminal proceedings against crew members of the vessel being resolved: Olbers Co Ltd v Commonwealth of Australia (No 2)  FCA 177. Interlocutory decision dismissing application for preliminary hearing on questions of law regarding the legality of the arrest: Olbers Co Ltd v Commonwealth of Australia (No 3)  FCA 651. Trial decision dismissing application: Olbers Co Ltd v The Commonwealth of Australia (No 4)  FCA 229. Decision of Full Federal Court dismissing appeal: Olbers Co Ltd v Commonwealth of Australia  FCAFC 262. Transcript of refusal of special leave application by High Court: Olbers Co Ltd v The Commonwealth of Australia & Anor  HCATrans 228. 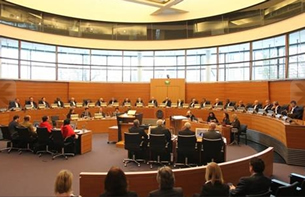 Judgment by ITLOS (by a 19:2 majority) that the allegation made by the Russian Federation that Australia has not complied with the provisions of UNCLOS for the prompt release of the vessel or its crew upon the posting of a reasonable bond or other financial security is well-founded. For a media story on the arrest of the Volga, see the Environmental News Service. Md. Saiful Karim, ‘Conflicts over Protection of Marine Living Resources: The ‘Volga Case’ Revisited’ (2011) 4 Goettingen Journal of International Law 101-127, which includes a discussion starting at page 122 about Russia's reasons (based on national interest and reputation) for not taking other litigation against Australia over breaches of Article 111 of UNCLOS. * Thanks to the Australian Fisheries Management Authority for supplying the court documents for the Federal Court proceedings used in this case study.